Posted on September 15, 2012 by A. Obviously, spoilers abound. This was written with the assumption that anyone reading this has played through the entire Mass Effect series. Ready? You sure? Then let’s get to it. She is dark skinned and has a shaved head. She was born in an overcrowded city on Earth. Some time after joining the military, she found herself the sole survivor of a mission on Akuze. The rest of her team was eaten by thresher maws. In the first Mass Effect game, she didn’t shoot Wrex on Vmire. She saved the Rachni queen, and later sacrificed the Destiny Ascension during a space battle with a entity called Sovereign. She saved the galaxy. In the second game, she recruited a squad and went on a suicide mission to a collector base. Despite the odds, everybody lived. She saved the galaxy. In the third game, Shepard cured the krogan genophage. She brokered peace between the quarians and the geth. She killed a reaper with a space laser. Not everybody lived, but most of them did. She is trying to save the galaxy. My Shepard is not your Shepard. Your Shepard might be a renegade. Your Shepard might be dead. Your Shepard might not even be a she. The Mass Effect series is a narrative without a canonical text. Over the course of the game, you develop a protagonist and shape the fate of those around you. The choices I make in the game are different from my boyfriend’s choices, which are different from my roommate’s choices. Everybody’s game is different, and everybody’s game is canon. That level of choice doesn’t exist in any other kind of media. You cannot personalize your viewing of Pretty in Pink so that Duckie gets the girl. You can’t click through the plot lines of LOST in order to solve the mysteries you want to see solved. There was that one Batman comic in which the readers voted for Robin’s death, but it didn’t create an alternate, branching Batman series in which Robin lived. Instead, games like Mass Effect function a little like a Choose-Your-Own-Adventure novel. Mass Effect allows you to tweak the narrative as you experience it, so instead of a single story, there are thousands of possible stories starring your very own Commander Shepard. Except there aren’t a thousand different stories, not really. There can’t be. You are not literarily sitting down and penning the dialogue and plot twists to Mass Effect. You are simply selecting options that somebody else has written for you. The developers of the game cannot create a thousand fully unique games, because that would be impossible. Instead, they make a single game that you can customize to the point where it feels like it’s yours. There have been some complaints about the linear feel of the third game, which is the final game in the Shepard series. With this many possible outcomes, the game can’t not feel linear. There is no way for a pre-written branching narrative fully explore all of its conceivable permutations. So, instead, most the squad members who survived the second game can only appear in cameos in the third game, just in case they’re dead in your version. If they are dead, their role is filled by a similar NPC who mostly makes the same choices your dead friend would make if he or she were alive. Old plot points are resolved in quick asides, or in e-mails and war asset notifications. The game acknowledges your choices, but the core plot marches on. Even major plot decisions, like Wrex’s possible death or the fate of the Destiny Ascension, are expressed mostly by mathematical scores. See, one of the main mechanics of Mass Effect 3 is this thing called “war assets”. You are trying to get your war assets score as high as possible, because your final numerical score will effect what kind of ending you get. If Wrex is alive, you get more points than if he’s dead. If the Destiny Ascension was saved, you get a certain number of points, but lose the Alliance 5th fleet and its points. No matter what decision you make about the Rachni queen in the first game, you’ll always encounter a Rachni queen in the third. She’ll just be a lot more trustworthy if she’s the one whose life you’d saved, and in that case will provide you with more points. Who really cares if Kaiden or Ashley survives the first game? Both of them are dull characters, and neither of then particularly effects the plot of subsequents games. Either one gives you the exact same numerical advantage. In game, Garrus calls this “the calculus of war”. Garrus, I love you, but you’re bringing me down. If I cared about high scores, I would be playing a lot more Geometry Wars and a lot less Mass Effect. People are mad about the ending of ME 3, because you need to get a very high war assets score to get anything resembling a happy ending. This involves, in addition to completing the main mission, completing lots of side missions and the occasional scan and fetch. That’s understandable. That’s good. It makes sense. It should be hard to get a happy ending when the whole galaxy is being reaped by godlike machines. The war readiness multiplier, though, is a dirty trick. Its baseline is 50%, which cuts your base war assets score in half. If you play multiplayer, you can raise that percentage. I would find this annoying, but tolerable, if all one had to do was play a token amount of multiplayer to get that percentage score up. But here’s the barb. When you stop playing multiplayer, your percentage multiplier slowly drops. You have to continue to play multiplayer just to maintain that score. This is a problem for people like me, who like RPGs and care very little about multiplayer shooters. That’s a lot of work just to get the happiest of about six possible pre-scripted endings. I’ve really enjoyed Mass Effect 3. The quests are well plotted, the gameplay is fun, the dialogue is great, the battles are appropriately epic, and the stakes are high. Mass Effect 3 is a good game, but it’s a game that really shows how difficult it is for a narrative-driven game to create a narrative that feels truly non-linear. Mass Effect 2, as far as I know, is one of the very few RPGS in which your entire squad can canonically die, including your player character. While that’s a great concept, how does that effect the narrative of the sequel? Is it possible to acknowledge these choices in such a way that they feel like real choices, as opposed to just window dressing for the central plot? In comparison, let’s look at a game like Knights of The Old Republic. Knights of the Old Republic is a fairly linear game, with a single huge branch in the last leg of the game: light side or dark side. It’s a completely binary choice. Save the galaxy or try to rule it. Fight beside your friends or turn against them. Even though this plot line has a very limited number of choices, the choices you do make feel significant. The last section of the game is completely different if you choose the light side over the dark side, or vice versa. Your choice is important, and the narrative of the game reflects that. An effective branching narrative will give the player the illusion that they are creating the story as they play it, even though, in reality, all possible permutations of the story have already been written. Mass Effect 3 breaks that illusion. In the previous two games, our choices felt important. We were certain they were leading up to something, that all of those little plot chickens were going to come home to roost. In the final game, we discover they weren’t that important after all. That, I think, is what lies behind a lot of the fan dissatisfaction with the ending. What’s the point of saving the Rachni queen, or developing a friendship with Urdnot Wrex, or brokering peace treaties, or falling in love, if everything burns in the end? Why have choices at all, if the choices are ultimately meaningless? These are questions I think about a lot, and I’ll probably be writing more about video game narrative in the future. In the meantime, dear readers, I’d like to know what you think. What are your thoughts about the Mass Effect series, or about highly customizable RPGs in general? Is there a practical solution to making branching narratives feel more solid and satisfying? 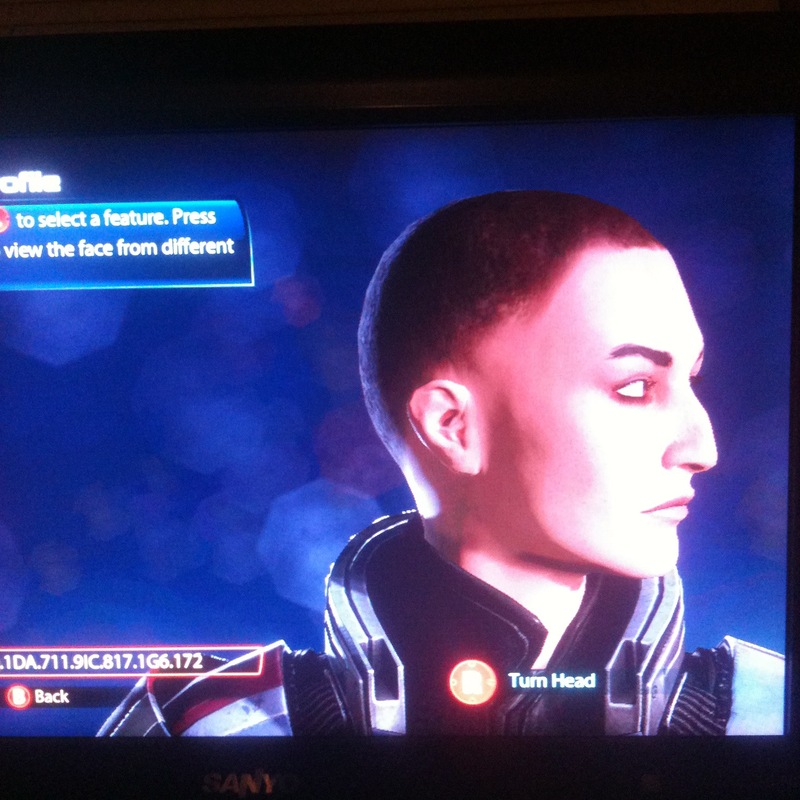 I haven’t yet finished Mass Effect 3, though I have a very good idea of where it’s going. I’m in permanent pause, hovering before the end game. Originally, I was waiting for the expanded ending to be released, but that release date has come and gone and I’m still not moved to play. I’m not sure what I’m waiting for. A higher galactic readiness score? An expanded expanded ending? Maybe I’m just not ready to say goodbye to my Shepard. Right now she is alive, and she is in love, and she is about to go save the galaxy. But, like I said before, my Shepard is not your Shepard. This entry was posted in essay, non-fiction and tagged mass effect, mass effect 3, narrative, video games by A.. Bookmark the permalink.